A club designee is responsible for assessing field conditions resulting due to inclement weather. Field Status Buttons (examples at right) will be posted on the main page of our website. Orange: Some fields open; see Field Status Notes. After field conditions are assessed and a decision taken, then the appropropriate Field Status Button will be posted on the main page of our website and a communication (via text and/or email) will be sent to Directors/Coordinators then to Team Managers and finally to parents. We strive to communicate cancellations by 4pm and 7:00am on practice and games days, respectively. Field closures are decided at the discretion of each club or association. Team managers should monitor field status and communicate to teams accordingly. 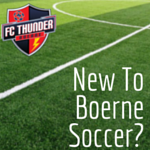 While FC Thunder strives to adhere to practice session and games schedules at Boerne City Park, inclement weather may cause cancellations. A club designee is responsible for assessing field conditions. If a decision is taken to cancel a practice/game, the cancellation notice will be communicated (via text alert and/or email) to directors/coordinators, coaches, team managers, and parents. In addition, a notice will be posted asap on the first page of club website. FC Thunder strives to communicate cancellations by 4pm and 7:15am on practice and games days, respectively. Practice sessions and games will be delayed and/or cancelled if lightning is observed. Players wishing to guest play with another club are required to obtain approval from their coach and the Director of Coaching. Players should wear FC Thunder warm-ups, with required uniform underneath, during warm-up and if on the bench. Players are prohibited from wearing warm-ups during games; however, exceptions may be made in extreme cold conditions (warm-up bottoms may be worn in this circumstance). If undergarments are worn, the color of the sleeve should be the same main color as the sleeve of the jersey or shirt and if undershorts or tights are worn, they are required to be the same main color as the shorts. Gloves and soft ear covering are allowed; however, hats are discouraged.